There's pretty lights. Happiness. Jolliness. Colorful decorations. Gifts. Family. Friends. Fun. AND COOKIES! SO. MANY. COOKIES! It's the cookie season! And now we can have even more fun with baking and put a fun spin on favorite recipes thanks to Nestle Toll House DelightFulls Filled Baking Morsels! 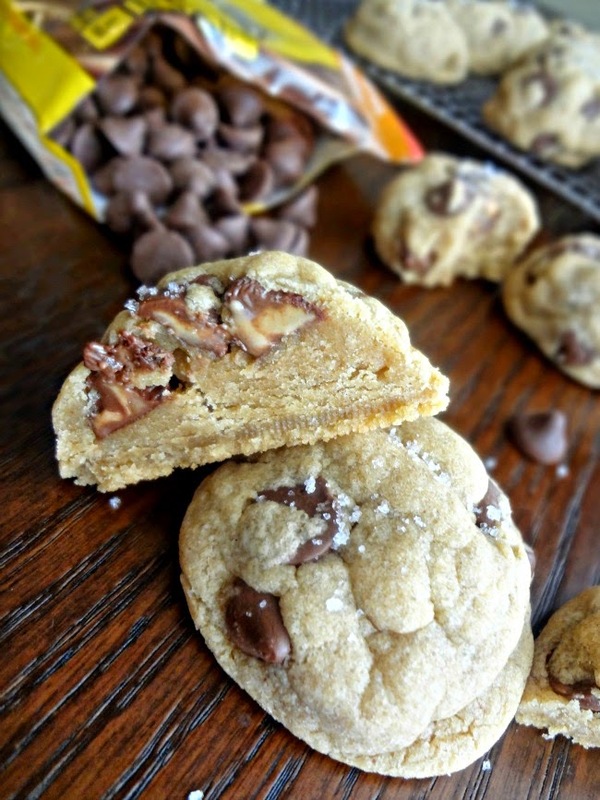 Just when you thought chocolate chips couldn't be improved! A couple months ago I spied a new fantastical thing---chocolate chips with...fillings?? It was one of those moments where you think to yourself "THAT'S LIFE CHANGING." and also, "Obviously-why hasn't this already been done?" All I know is when I found out that Nestle Toll House wanted me to play with their new DelightFulls I was SO EXCITED. Obviously...these were what I used! PEANUT BUTTER AND CHOCOLATE. These are the ones I can't wait to try next, I haven't been able to find them at my local store but I will continue my pilgrimage for gooey caramel filled goodness! I'm definitely going to be using these soon, too. Michael and I both adore dark chocolate and mint. I want to use these in a cheesecake sort of dessert for Michael I think-it's right up his alley! Back to Christmas talk: I'm in that very frustrating stage of life in between being a child and having children. I'm unable to fully experience all of my old Christmas traditions, but I don't have any kiddos to create new ones with! That said, Michael and I are definitely already forming new traditions. And this year I will enjoy the last bit of my most time-honored and important childhood Christmas experience for the last time: I will spend the night at my mom's, wake up with my brother, and enjoy Christmas morning being all excited and happy (although we probably won't wake up at 3 AM like we used to--also...the presents aren't gonna be so overwhelming.) Next year Michael and I will be married and I'll want to wake up with him, so this is all a little bittersweet. The good news is, now that I'm home I can take part in other Christmas festivities! My mom and brother and I are actually going to a little Christmas village today. And next week we're going to decorate cutout cookies (which we always used to do as children and I haven't been able to participate in for a long time). And in the spirit of new things...I've been tasked to make cookies for other things. Like Michael's work party. And who knows what else! I'm really looking forward to, in the next 5 years or so, having little chubby helping hands and seeing little innocent eyes light up and seeing chocolate smeared little smiles in the kitchen with me. I adore baking and I cannot wait to share that with my children, and to share all the love that I bake into every bite! Anyway. 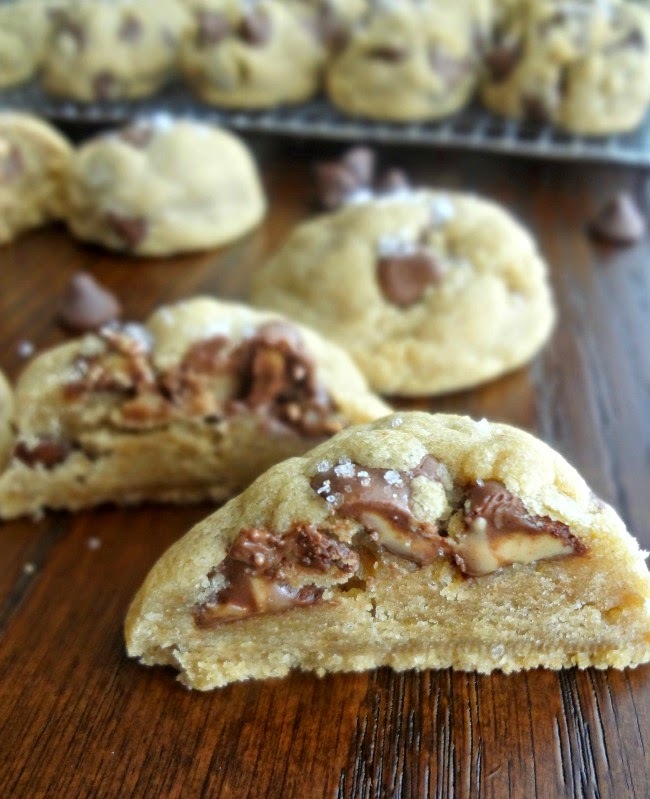 What I'm saying is: make these cookies. Especially for the holidays (I bet Santa would put you on the extra nice list for LIIIFE if you made them for him, btw.) Get your hands on some Nestle Toll House DelightFulls Filled Baking Morsels. Have some fun. Bake. Experiment. Make traditions! Eat. BE HAPPY. Preheat oven to 325F degrees. Prepare a large baking sheet by spraying with nonstick cooking spray or lining with parchment paper or silicone baking mat. Measure peanut butter into a large, heatproof, bowl. Brown the butter-In a, preferably light colored, saucepan melt butter over medium heat. Whisk constantly as it foams, bubbles, and eventually turns amber and little brown bits form. Immediately pour over the peanut butter and mix until the peanut butter is completely melted and smooth. Let cool until no longer hot or overly warm. Add sugars and salt and beat with a hand or stand mixer until completely combined. 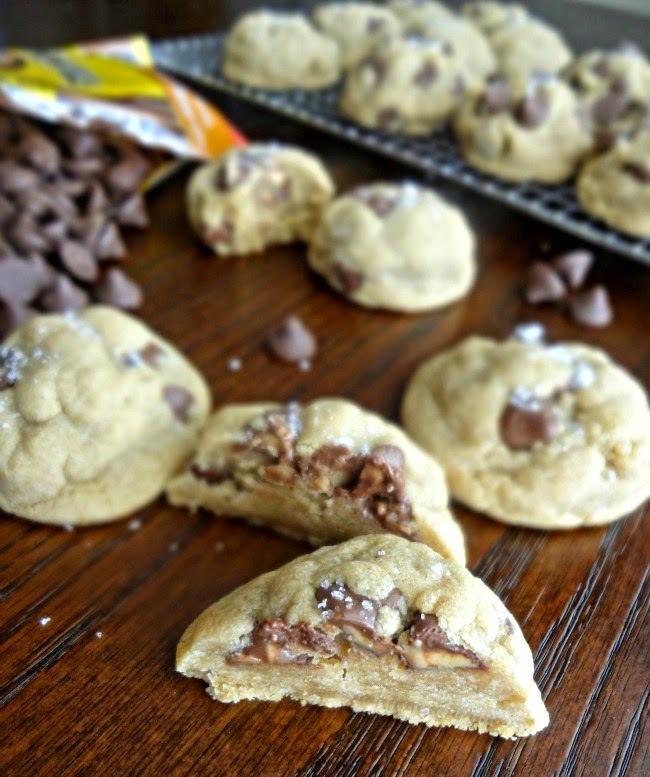 Fold in the chocolate chips/DelightFulls. Shape dough into the size of golf-balls. Place on baking sheet about 2 inches apart (I had to do 2 baking sheets worth so I just let the remaining dough sit until I transferred the baked cookies to a cooling rack and then I used the same sheet for the rest of the cookies) and bake for 10-12 minutes, until the edges are slightly golden and the center is still soft and puffy (don't over-bake). Sprinkle with sea salt and let cool on sheet for about 5 minutes before transferring to a wire cooling rack to cool completely. Enjoy! Store leftovers in an airtight container for up to 7 days. Do you see it? You see the peanut butter filled chocolate chip all melty and perfect?? LOVE. And hey-if/when you decide to try out some DelightFulls don't forget to share on social media #TollHouseTime #NestleTollHouse #DelightFulls! 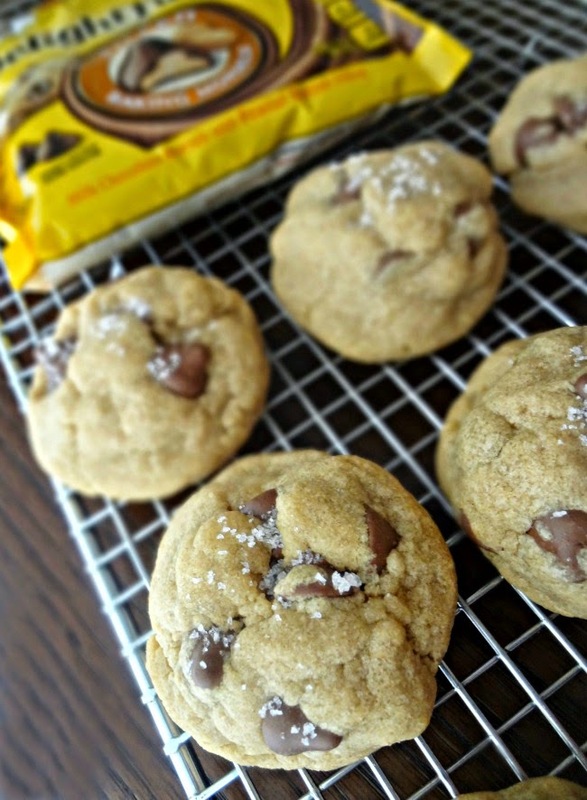 Today’s post is sponsored by Nestle Toll House, I earn revenue for each link you click on, but my love for their DelightFulls filled morsels is all my own!